In recent years, Indiana residents have seen an immense amount of damage to tree populations by the metallic green ash borer. Entomologists now warn that this damage could dramatically increase due to the potential arrival of the Asian longhorned beetle. This insect targets 12 unique types of trees. These include the ash trees, the elm trees, and maples. Essentially, this insect has the capability of targeting all of the trees that make up the unique composition of the forests located throughout the State of Indiana. They have already destroyed thousands of trees within the surrounding states. Now, it could be invading a tree near you. Identifying the asian longhorned beetle and its damage is of the utmost importance to your trees. The Asian long-horned beetle is a relatively large insect, which ranges in size from 0.75 inches to 1.25 inches in length. The antennae is long and is colored black and white. The body is also black, with white spots. The insect has the capability of flying, but rarely does. In some instances, onlookers may notice a blueish tinge on the underside of the pest, on the legs, and perhaps a tad on the antennae. The Asian long-horned beetle enters the heartwood area of a tree as the larvae goes through the maturing process. Large amounts of the insect feed in this area and destroy it. By engaging in the girdling process, the tree that has been invaded is killed. In the mid to late summer months, adults will exit through holes that are located throughout the bark. As a result, the sap of the tree will seep from the holes. As a result, other insects and an assortment of diseases will attack the tree. When trees are destroyed, it affects shade space, trees of economic value, and poses the direct physical threat of falling limbs and whole trees on vehicles, people, and structures. The Asian long-horned beetle is most abundant in Korea, China, and Japan; however, there are several areas within the United States where this insect abounds. This includes California, New York, Illinois, and New Jersey. Entomologists expect this insect to make its way into Indiana and urge residents to watch closely for infestations. The sooner an infestation is identified and eliminated, the better. Numerous warehouses and ports situated throughout the United States have actually intercepted these tree-killing insects. 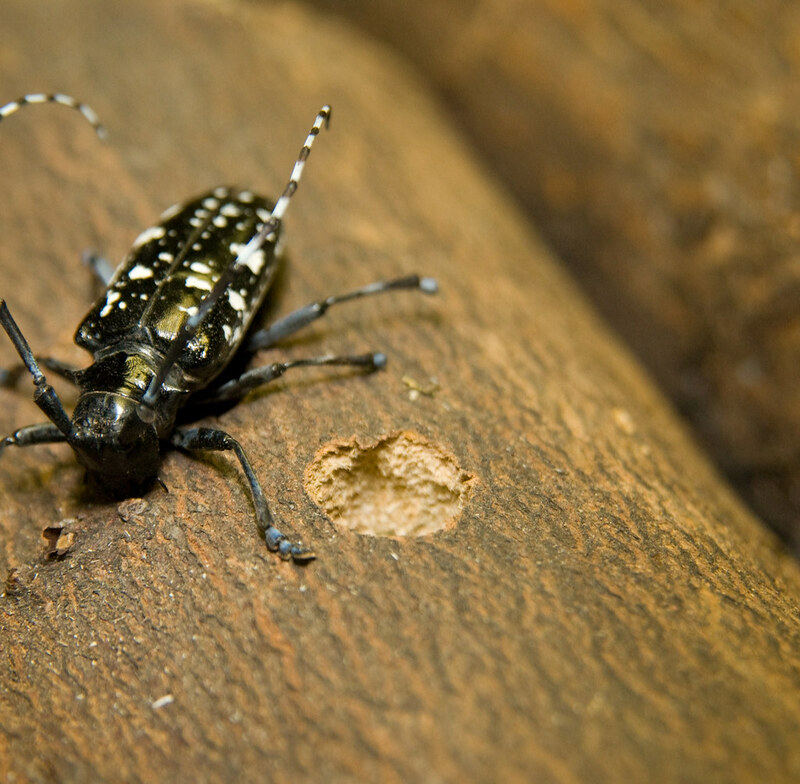 According to Rhonda Santos, who works with the USDA, the Asian long-horned beetle is considered to be one of the single most destructive pests within the United States. The USDA is working closely with communities to eliminate the pest. Not only do they inspect trees, they also remove those that are infested. Furthermore, quarantines are set up when an infestation is present.